Q: What is The Driver about? A: The Driver is about a boxer who gets involved with some criminal friends who talk him into being the get away driver for a robbery. A down-on-his luck Boxer agrees to be the driver for a heist. When things go horribly wrong, he finds himself with a dead partner and a duffle bag full of cash. With no one else to account for the take, the boxer decides to keep half for himself, but is promptly busted by his employer, who gives him a choice: kill or be killed. The film’s producer is Oscar Winning actor & film maker Forest WHITAKER and will direct by Alex ARDENTI. Q: What sort of mood are you trying to evoke with the score? A: I approach every film individually. But action & drama is a cut above then others. I am full of dramatic feels. When I take a project based on a couple things. At this stage in my career, there are a lot of relationships involved. A handful of directors, when they do a movie, it’s a no brainer. It’s an automatic. Just do it. You know, it’s like a marriage- you’re in there for better or worse. And sometimes it’s better, and sometimes it’s worse, but friendships are established and creative relationships are established and it becomes very meaningful in that regard. Q: What kind of challenges have you faced in scoring the film? A: Making music for a film is really difficult job. Because you have to think a lot of details such as what the director wants, what the script tells, must or mustn’t there be music on the scene etc. When i started thinking about the theme right when I read the script, except that I wasn’t really sure what the look would be, but I loved read to script. I never write to music according to the script. Because while I’m reading the script there is a lot of scenes in my mind. And I can’t write to music to them because of the director shooting the film according to his/her imaginations not mine. So, my score can be drippy or fussy at last. This is really big risk for my score and for the movie. I usually read the script and watch early cuts of the film first. Then, I conceive of a concept that will be associated with the score – something identifiable as that film. Then I start composing character themes and/or more abstract themes. Eventually I meet with the director and go over ideas for the cues and spot the film, choosing where and what music should go in the film. After a lot of composing and work I end up with a stack of sheet music and an uncountable amount of backing music tracked at my studio. I eventually end up on the scoring stage conducting the orchestra. I always find that the story sets the mood, and the characters need to be identified by who they are. Their themes are always affected by whatever the mood is. Depending on where the character is in his or her life, it definitely affects the way I’m going to write the music. That’s why you hear this reluctant superhero vibe. It’s very prevalent. Q: What kind of training and background have you had? A: Music was always a passion of mine. I did not grow up in a household of musicians, but they were music lovers. I started to Piano lessons when I was 6. During 10 years I played classical Piano repertoire, such as Beethoven, Mozart, Chopin, Rachmaninoff etc. After that i started Composition, Orchestration and Film Scoring lessons my high school times. They were very interesting and awesome years for me because I discovered a lot of new things about the music. Film Music is always be my favorite concern. Because while I was playing the music on the Piano or whatever (I’m multi instrument) I was dreaming some scenes in my mind. Later I taught myself acoustic drum and bass guitar, got interested in world instruments. Composing started at a fairly young age and then by my teen years I was very passionate about composing although I had no forum to showcase what I loved to do. I’m playing The Piano, Cello, Violin, Acoustic Drum, Bass Guitar, so I can play and record their partitions for my film scores at the studio. 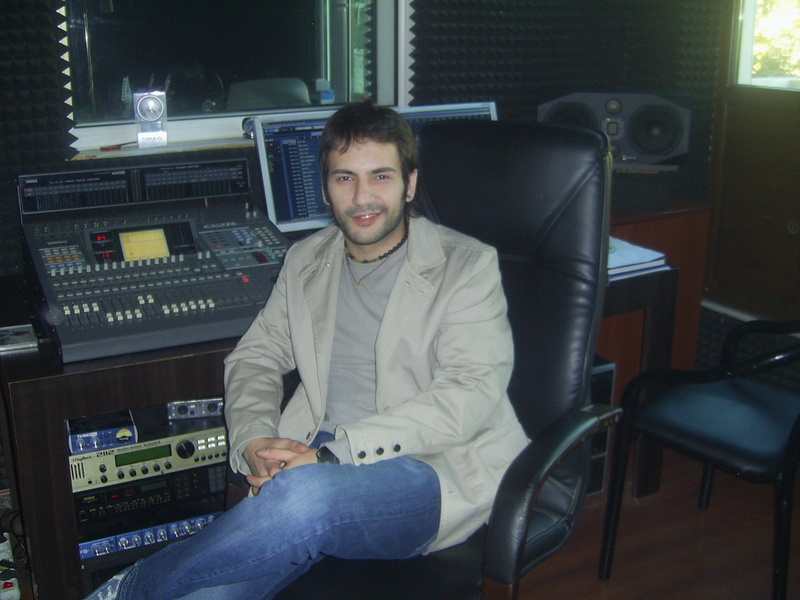 When I was 21, I started Yildiz Technical University, Music Composition department. After that 4 years I went to Canada (Toronto music academy) for 2 years. When I finished that school I started Thornton School Of Music, Film Scoring department. Q: You’ve done a lot of exercise video music; what are the key ingredients to good exercise music? A: Yes, I’ve composed a lot of music for Gyms & Nutrition companies such as Alpha Pro Nutrition, Mutant, 4+ Nutrition, Betancourte Nutrition etc. I started to write music for this kind of commercials after I meet Alex ARDENTI (www.alexardenti.com) who produced and directed films, documentaries and commercials. He is awesome person and incredible talented artist. He is producer, director and also professional photographer. He will direct “The Driver” movie that i will compose music. Our first job was a documentary film about 2008 Mr. Olympia Dexter JACKSON called “Unbreakable”. Alex really loved the main title music and asked me; “would you like to write music for nutrition commercials?” and I said “of course!” Today, we’re still working together for all Ardenti Films productions. Making music for a commercial is very interesting and forcible process. Because you have to understand what the brand needs. The music must give brand equity to the commercial. Usually, producers and jocks want high motivation music for their commercials. Ingredients for good exercise video music is crescendo and inspirational beats that motivate someone to exercise. A: Everybody knows me as a composer who works very fast. That’s absolutely true! I scored “Killer Bees” documentary for Discovery Channel 5 years ago. When i finished to the score they said; “we changed the editing and you have to write music one more time for half of the documentary and we have just 1 day”. I was surprised but I finished on time (37 minutes full orchestral music) in 5 hours. Because I’m multi instrument as I said, so I’ve played a lot of partitions for the documentary. I’m working 15-18 hours in a day. Q: What are some of the major difference between the film industry in Turkey and the industry here? A: Actually there is no big difference. 12-15 high budget movies completed in Turkey every year and a lot of low budget movies. Turkish filmmakers don’t use lots of technology. For instance, there is only a few studio movies in Turkey last year. Film composers use the sample technologies generally, but sometimes (if the budget enough) they can use the live orchestra for recording seasons. I have my own orchestra (37 players) and I’m using live musicians as much as I can for my projects. A: I’ve a big soundtrack archives, I’m listening a lot of musical style. My father taught me Turkish ethnic music and I love it so much. I studied a few different schools about the music and i discovered a lot of musical styles. I can compose east and west music because of this. Q: What has been your greatest professional triumph? Q: What famous film would you like the opportunity to rescore? A: I’ve composed additional music for “Fast & Furious Fast 5-6″, “Killer Bees” documentary film, “Goonies” review scores, “Kubilay” film, “3 Kadin 3 Kader” film, “Mr. Olympia Dexter Jackson-Unbreakable” documentary film, “Mutant Leaving Humanity Behind” series, “Four Seasons Hotel” commercial and “The Driver” film right now.